The author of this article has obviously never seen a NYC studio. To call this "small" is like referring to Versailles as "a spacious and comfortable abode." 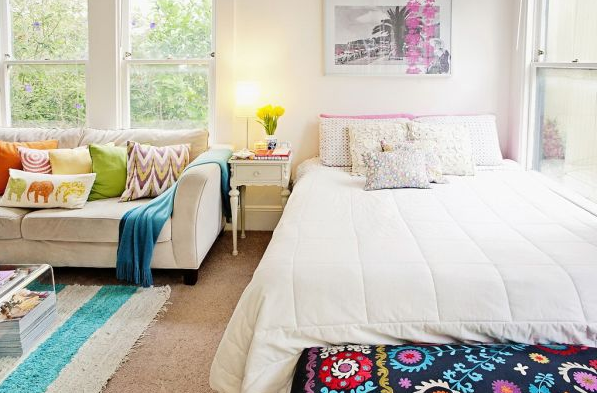 Although yes, it is small in square feet, it has huge open windows and a nice rectangular floor plan where you can actually walk around and not bump into every piece of furniture in it. If I lived by myself, I would kill for a studio like this in Manhattan. IT IS ADORABLE. 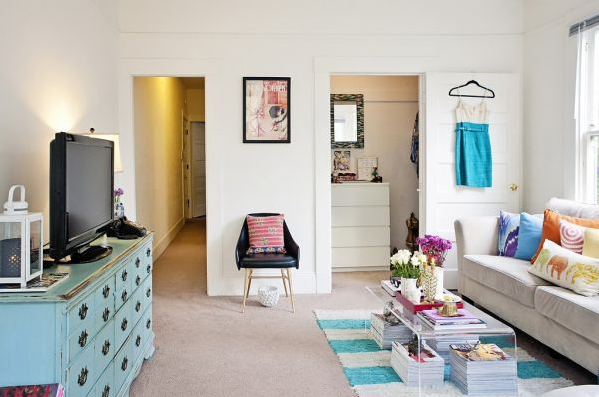 It doesn't hurt that the renter decorated it in a quirky yet chic style. A few years ago, a friend lived on the UWS in a studio - it was literally a sliver of a place that fit roughly 1.5 persons inside. She was, however, able to fit a small kitchen/dining room table which I have never been able to do. We would eat pasta and drink wine while complaining about work or gossiping about what happened on Lost the night before... It was a nice change to eat meals not hunched over the coffee table. First of all, look at that closet. YOU CAN WALK INTO IT. There is a dresser INSIDE of it. I don't even have that much closet space and my bedroom is about the size of this entire studio. Only in my dreams will I ever have a walk in closet especially now that everything is covered in baby stuff. The bureau/tv stand alone makes up for the possibility of junk strewn around... Just hide it in the dresser! I like the fact that this person uses a see-through coffee to open the room... I do not however, support the stacks of magazines underneath - even if they are topped with cute sculptures. Precious real estate covered in piles of mags - yikes!